In honor of President’s Day in February we here at the Hall of Presidents would like to feature an old tried and true recipe that would be perfect on those cold winter days. Assemble ingredients in a crock pot. Cover and cook on low 8-10 hours or until beans are tender. Makes 8 servings. This savory bean soup made with ham, celery, and parsley leaves is perfect served with a loaf of French bread on the side. 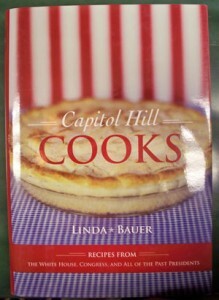 This recipe is courtesy of the wonderful cookbook Capitol Hill Cooks featuring recipes from The White House, Congress and All Of The Past Presidents, by Linda Bauer available at The Hall of Presidents, Gettysburg, PA.
Posted in Blog, Hall of Presidents & First Ladies, Recipes and tagged bean soup recipe, Capital Hill Cooks, Congressional Bean Soup, crock pot meal, Gettysburg PA, hot soup recipe, Linda Bauer, Presiden't Day, Recipes from the White House, The Hall of Presidents on January 26, 2014 by Gettysburg Battlefield Tours.